Heat oven to 350°F. Spray 6 regular-size muffin cups with cooking spray. Flatten each cookie slightly into 3-inch circle. Press in and up sides of muffin cups. Bake 13 to 17 minutes or until edges are set. Immediately press indentation into each with end of wooden spoon. Run knife around edges of cups to loosen; cool in pan 15 minutes. Remove from pan to cooling rack; cool 10 minutes. 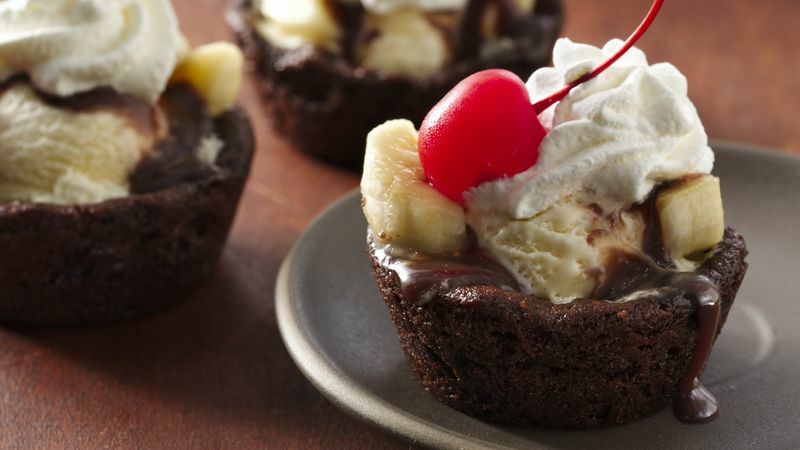 Fill each cup with 2 tablespoons ice cream; top with 4 banana pieces, 1 teaspoon chocolate topping, whipped topping and maraschino cherry. Serve immediately. Chocolate fudge topping can be substituted for the chocolate topping if you prefer. Any flavor of ice cream can be substituted for the vanilla.